Built in the 11th century, the Fort was where the Battle of Chanderi was fought and where Mughal Emperor Babur captured the city from Medini Rai. The main gate of the fort is called ‘Khooni Darwaza’referring to the criminals that were thrown from the walls above. Today, the Hawa Mehal and Nau Khanda Mahal sections of the Mahal still remain strong and offer a peek into the history of the city! The view of the town from here,completes the visit. Open from Sunrise to Sunset every day. 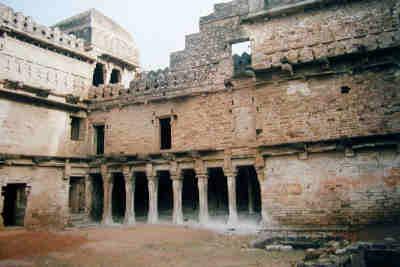 How popular is Chanderi Fort? People normally club together Jageswari Temple and Badal Mahal Gate while planning their visit to Chanderi Fort.